I'm getting ready to split the cases on my 52 K model. It hasn't been started in many years and everything has a light coat of rust. The transmission shaft moves and the shift lever moves some, but it won't shift out of neutral. So before I get into the project, are there any special tools that are required to do the job? I have read the sections on engine and transmission for the 59 Sportster and they show the need for special pullers like to pull the crankshaft sprocket, but there may be work arounds. I changed second gear on a 83 Sportster without using any special tools but that was many years ago. Any up front advice would be greatly appreciated. Dismantle all bolts and screws, left and right. 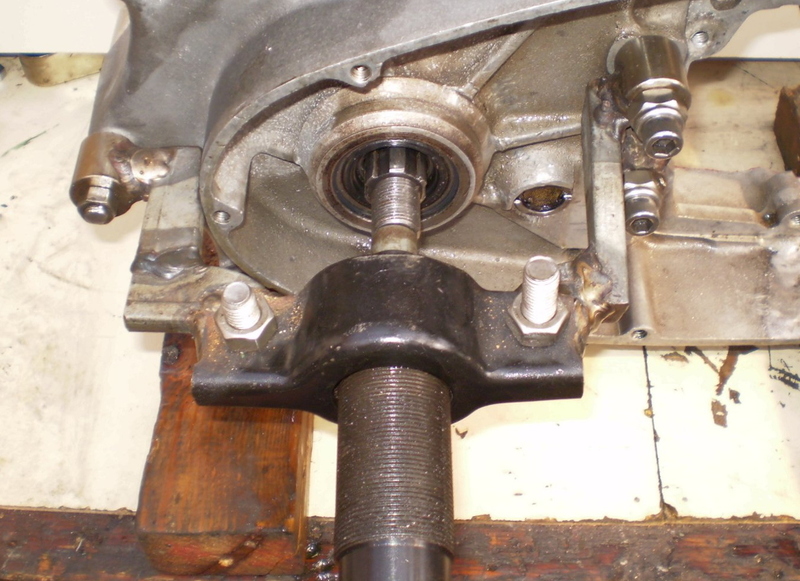 Lay left hand side crankcase down on wooden spacers to clear drive main shaft and clutch gear from bench. Lift right hand side crankcase up together with rear engine mount. After that, you only need hydraulic press or "pusher" to push crank out of left case.